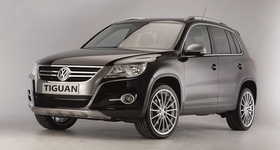 VW launched the Tiguan in China this year to exploit a boom in SUV sales. SHANGHAI -- SUV sales in China are hitting new highs. Due to strong demand for compact SUVs in urban areas, the segment will continue to grow faster than the overall market, predicted John Zeng, the Asia forecasting director for J.D. Power and Associates. About 154,000 SUVs were sold in September, a monthly record for the segment, according to J.D. Power. For the first nine months of 2010, SUV sales doubled to 154,000 units. "Most of the SUVs sold in China are CUVs (crossover utility vehicles), which have smaller engines than regular SUVs and are typically used in cities," Zeng said. Except for the Toyota Highlander, the best-selling SUVs -- the Honda CR-V, Great Wall Hover H and Toyota RAV4 -- have engine sizes of 2.5 liters or less. With its two engine options -- 2.0 liters and 2.4 liters -- the CR-V is China's best-selling SUV. Through September, CR-V sales soared 31 percent to 102,000 units. Urban motorists like compact CUVs because they combine fuel efficiency, roominess and an high seating position that offers a good view of the road, Zeng said. Automakers are adding new models to exploit this fast-growing segment. This year, Volkswagen AG launched the Tiguan while Kia Motors Corp. introduced the new Sportage. Both models are built in China. In December, Ford Motor Co. will roll out the Edge, and next year Mazda Motor Corp. will launch local production of the CX-7. However, CUV sales may cool a bit at the end of this year, when the Chinese government is expected to phase out its 25 percent purchase tax cut for vehicles with engine sizes of 1.6 liters or below. Zeng says industry sales are expected to grow 10 percent in 2011, down from 25 percent this year. What will happen to the SUV segment? "Due to robust customer demand," Zeng said, "this segment will continue to grow faster than the overall market."